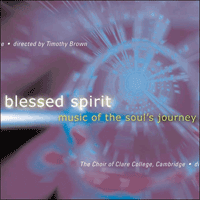 For their second appearance on the Collegium label, the acclaimed choir of Clare College, Cambridge take us on a tranquil journey towards the soul’s destination in heaven. Music of many centuries blends seamlessly in the almost celestial acoustic of the Lady Chapel of Ely Cathedral to create a timeless, uplifting programme of pure, angelic beauty. The first two sections of this programme are introduced by Gregorian chants taken from the Missa pro defunctis, the Mass for the dead which is one of the most solemn rites of the Christian church. Requiem masses were, according to medieval custom, celebrated on All Souls’ Day (November 2nd) and also at burials and on certain anniversaries of burials. Requiem aeternam is the opening prayer, incorporating a verse from Psalm 65 (Te decet hymnus). In the Orthodox liturgy of matins, a kontakion is a one-stanza hymn which is generally followed by an ikos, that is, one or more further stanzas to a different chant melody. There are kontakions for all the major occasions of the church’s year. The Kontakion of the Departed, performed here with its accompanying ikos, is an appropriately sombre chant of the Kiev tradition, ‘modernized’ by a nineteenth-century harmonization. The music of the kontakion is in regular metre, the ikos is freer and more chant-like. In this passionately vivid and declamatory setting of a hymn from the Orthodox liturgy of remembrance, Tchaikovsky shows his mastery of the choral medium and his dramatic grasp of issues of life and death which, as a Romantic artist, he often confronted in music, though rarely in the religious sphere. His first sacred work was the Liturgy of St John Chrysostom in 1878; its success prompted the Tsar to ask him, at an audience early in 1884, to write more for the church. The Nine liturgical choruses, of which Blazheni, iazhe izbral is No 7, were written later that year as his response. The imperial chapel choir under their director, Balakirev, performed the set for the Tsar, who must surely have been impressed with the fervour and rich choral sonority of the music. The distinctive and visionary style which John Tavener has made his own is nourished by the liturgy and chants of the Orthodox Church, of which he has been a member for some years. The Funeral Ikos, written in 1981 for the memorial service of his much-loved former school music master Edward Chapman, is an early example of his many sacred choral pieces. Its strophic structure and simple homophonic textures throw the text into sharp relief while creating an atmosphere which is reverent, solemn, and yet not without a spirit of consolation. Victoria has long been regarded as the greatest Spanish Renaissance composer, despite being both less prolific and less versatile than many of his contemporaries: virtually his entire output, all of it Latin church music, is contained in only eleven volumes, all published in his lifetime. He began his musical life as a choirboy at Avila Cathedral, then moved to Rome to study at the Jesuit Collegio Germanico; he may have received tuition from Palestrina. He was made director of music at the Collegio in 1573, and was ordained priest in 1575. Despite growing European fame as a composer, he wanted to return to a quieter life in Spain, and in 1587 he accepted Philip II’s offer to become choirmaster and chaplain at the convent of Descalzas Reales in Madrid, where he remained until his death. O quam gloriosum, one of the best-loved of Victoria’s compositions, was published in 1572 in his First Book of Motets and reprinted a number of times. It was later used by Victoria as the basis of a mass setting, published in 1583. The text is proper to the Feast of All Saints (November 1st) when Christians remember the company of saints in heaven. Victoria matches the imagery of the text with flowing, transparent vocal lines which (unusually for the time) are not based on any pre-existing Gregorian chant but are freely composed. The Anglican liturgy has no Requiem Mass, so there are no English Requiem settings for liturgical use. Conscious, perhaps, of this lack, in 1915 the church musician Henry Walford Davies (organist of the Temple Church in London) composed a work he called A Short Requiem, intended for church use, which assembled a number of appropriate texts from biblical and liturgical sources. It was inscribed ‘in sacred memory of all those who have fallen in the war’. The present two movements, which follow without a break, are the fourth and fifth. The overwhelming popularity of Holst’s orchestral suite The Planets has sometimes obscured the fact that the majority of his wide-ranging output was vocal and choral. Like his friend and supporter Vaughan Williams, he had a strong interest in poetry, coupled with the ability to respond to it in musical terms, and the texts he set were drawn from both Eastern and Western traditions, even including the Hindu Rig Veda. This reflected his mystical leanings, which were not shared by Vaughan Williams; however, both composers wrote fine settings of the English metaphysical poets. Henry Vaughan, author of The Evening watch, was in fact Welsh, Oxford-educated and by profession a doctor. His poem, inspired perhaps by first-hand experience of attending upon the dying, takes the form of a dialogue between the body and the soul. Holst’s setting, written in 1924-5 as the first of a projected series of unaccompanied motets which never progressed beyond two inaugural pieces, is one of the most extraordinary and visionary pieces of music he ever wrote. Slow and hushed, its choral textures mainly note-against-note, the music creates dark towers of sound with resonant fourth-based chords, magically coalescing into a final climax which seems bathed in transcendental light. Uncomprehending reviews of the first performance at the 1925 Three Choirs Festival show that Holst was ahead of his time; but The Evening watch was not without later influence on Benjamin Britten, whose Hymn to St Cecilia (1942) has passages strongly reminiscent of it. The heritage of black American spirituals—the religious folksongs of the southern slaves—was first brought to international attention in the 1870s by the performances of groups such as the Jubilee Singers from Tennessee and by the publication of collections. Since then, each generation has in different ways made this heritage its own, and such is the inherent strength of the songs themselves that they have transcended every style of arrangement and performance. Early collectors testify that spirituals were originally sung in a kind of embellished unison, but it was not long before harmonized choral arrangements began to be popular, influenced perhaps by white hymnody. The sophisticated, lush choral versions heard in earlier twentieth-century concert programmes often tended towards sentimentality; the spare, almost angular reworkings of five familiar spirituals in Tippett’s A child of our time (1942) set a new style. Steal away, heard here in Timothy Brown’s vivid new arrangement, is typical of many spirituals in that its subject-matter is the slaves’ longing for the reward of heaven after the hardship and misery of earthly life. It is not known who composed the haunting Dorian-mode melody of this hymn which survives only in a fifteenth-century German hymnal, but it could possibly be the work of Peter Abelard, the twelfth-century French theologian who indisputably wrote the text. Abelard is remembered today for the boldness of his theological views, which brought him into conflict with the church, and for the story of his great love for Heloïse, niece of Canon Fulbert of Notre-Dame. O quanta qualia is the best-known of his hundred or so surviving hymns. As a recusant Catholic in Protestant England, Byrd can scarcely have known the true peace of which the text of this lovely motet speaks; indeed he must have often recalled the ‘torment of death’ suffered by many of his co-religionists, from which, in his intolerant era, heaven itself was the only safe refuge. Perhaps this lent poignancy to his musical setting, which was published in 1605 in Vol 1 of his Gradualia, a collection of motets for the church’s year—one which could not then legally be used in worship and which should probably be seen as a testament of his compositional art and his religious faith. Within a succinct time frame, Byrd seems to evoke the calm vistas of heaven: the rigid imitative counterpoint of earlier generations of Renaissance composers has been replaced by a more flexible and chordal texture where the independence of voices is never sacrificed but where a clear and expressive declamation of the text is paramount. Particularly affecting is the final page, where descending scales in all five voice parts seem to lull us gently into endless peace. For the American slaves, crossing the River Jordan was a metaphor for passing from this world to the next. In Deep river the longing to ‘cross over’ is movingly expressed. The mood of this spiritual is perfectly captured in Norman Luboff’s classic arrangement; he was a leading American choir director and choral arranger who helped bring about a significant awakening of choral music in America in the second half of the twentieth century, both through the recordings and concert appearances of his own choir, and through his work as a conductor, arranger and publisher. This gentle, valedictory prayer comes from the old Catholic Burial Service and was sung as the funeral procession made its way to the cemetery. Fauré may well have been the first to incorporate it into a Requiem setting as the concluding movement. The music and poetry of Hildegard of Bingen—abbess, mystic and writer—has come to be widely appreciated only in recent years. She gathered together her 77 sacred songs in a liturgically ordered collection called the Symphonia armonie celestium revelationum; O felix anima is a responsory for the feast of a now obscure local saint, which expresses in soaringly poetic words and music the Christian vision of the saints in glory. The music of John Sheppard represents a last glorious flowering of the pre-Reformation spirit in England, akin to Perpendicular architecture. The soaring lines of his polyphony reach heavenward like a spire, his choral textures seem filled with light like an East Anglian church interior. All too little is known of this extraordinary composer. He was choirmaster at Magdalen College, Oxford, from 1543 to 1548 and a Gentleman of the Chapel Royal from about this time until his death. Most of his surviving music is for the Latin rite, some of it dating from the brief and unhappy period of Catholic revival during the reign of Mary Tudor in the 1550s. Audivi vocem, a respond for All Saints’ Day, is typical of much English church music of this time in consisting of alternating sections of Gregorian chant and polyphony. As a vision of heaven it is doubtful whether either the poetry or the music of this brief choral masterpiece (‘anthem’ seems an inadequate designation for it) have been surpassed. Edmund Spenser, the poet, needs no commendation here, but the little-known composer William Harris deserves note as the unexpected source of such a passionate musical outpouring, closer to Richard Strauss’s Metamorphosen than to any precedent within the comparatively reserved Anglican tradition. For most of his long life Harris was a cathedral organist and teacher; from 1933–61 he was organist at St George’s Chapel, Windsor, but Faire is the heaven was written before then, in 1925, though revised in 1948. It remains his finest work (arguably matched by the later and rather similar Bring us, O Lord God), one of only a handful of published compositions by a fondly-remembered organist who was touched by the hand of genius at least this once in his life. The theme of this album is the music of heaven and our journey to heaven. Both of these concepts, of course, can only be imagined, not objectively described. In medieval Christendom, there was a clear vision of heaven, as there was of hell, and the imagery used then by poets and artists—and by churchmen looking for carrots and sticks to subdue their flock—is still familiar today: heaven (above us) is a place where the residents sit upon clouds in white robes, and angels endlessly sing and play their harps. Hell (below us) is a burning furnace stoked by devils with horns, tails, and pitchforks to prod the lost souls who howl in eternal torment. As scientific knowledge and rationalism have advanced, so this simple vision has become blurred: contemporary theologians within the mainstream Christian tradition have tended to define heaven and hell in increasingly abstract terms, or have decided that they are no longer meaningful concepts. Paradoxically, the music inspired by the old medieval visions has never been more popular: the great Requiem settings of Mozart, Verdi, Fauré and others pack concert halls and churches the world over. Behind this almost over-familiar repertoire of music expressive of the journey from death to life is a wealth of wonderful smaller-scale music which has, over the centuries, accompanied the church’s rites of passage and given believers a vision of the life to come. This album gathers together some of the best and most inspiring examples, intentionally drawn from different eras and traditions, some of which would not normally be found together on the same recording. Superficially William Byrd who composed Iustorum animae and the American slave who first sang Deep river have little in common: yet their longing for heaven was the same. The programme divides into three sections, each introduced by a Gregorian chant. The first section is devoted to music of mourning and remembrance, the second moves on to thoughts of the departed soul’s destination, and the final section moves to heaven itself. The almost celestial acoustic of the the Lady Chapel of Ely Cathedral made a gloriously appropriate setting for this recording, which follows on from Illumina (COLCD125) and marks the second appearance on the Collegium label by the Choir of Clare College, Cambridge. Le thème de cet album est celui de la musique des cieux et de notre parcours pour arriver au ciel. Ces deux concepts ne peuvent évidemment relever que de notre imagination et non pas d’une description objective. Au cours de la Chrétienté médiévale, la vision des lieux célestes était claire, ainsi que celle de l’enfer, et les représentations qu’en faisaient les artistes et les poêtes—de même que le clergé en quête d’images de récompenses ou de coups de bâtons pour mâter leurs ouailles—sont encore bien connues aujourd’hui: le ciel (au-dessus de nous) est un lieu dont les résidents, vêtus d’une robe blanche, siègent sur les nuages tandis que les anges chantent et jouent de la harpe au fil du temps. L’enfer (en-dessous de nous) est une fournaise ardente alimentée par des diables qui ont des cornes, des queues, et dont les fourches font avancer les âmes perdues qui hurlent dans un tourment éternel. Avec le progrès des connaissances scientifiques et du rationalisme, cette vision simple s’est quelque peu estompée: les théologiens contemporains appartenant à la tradition chrétienne établie ont eu tendance à définir le ciel et l’enfer en des termes de plus en plus abstraits, ou ont décidé que ce ne sont plus des concepts significatifs. Par contre, la musique inspirée des anciennes visions médiévales n’a jamais été autant appréciée qu’aujourd’hui: les grandes mises en musique du Requiem par Mozart, Verdi, Fauré et d’autres compositeurs remplissent les églises et les salles de concert à travers le monde entier. En retrait de ce répertoire musical presque trop connu, expression du voyage de la mort à la vie, se trouve une profusion de compositions de plus petite envergure qui ont, au fil des siècles, accompagné les rites de passage de l’église et donné aux croyants une vision de la vie à venir. Cet album en rassemble quelques exemples parmi les plus beaux et les plus inspirés, sélectionnés intentionnellement à partir de traditions et d’époques différentes, certains ne devant normalement pas se retrouver dans un même enregistrement. Le compositeur William Byrd de Iustorum animae et l’esclave américain qui chanta en premier Deep river n’ont à première vue rien en commun: leur désir d’aller au ciel était cependant le même. Le programme est réparti en trois sections, chacune introduite par un chant grégorien. La première section est consacrée à la musique funèbre et commémorative, la seconde se tourne vers les pensées concernant la destination de l’âme prenant son départ, tandis que la section finale nous transporte dans les cieux mêmes. L’acoustique presque céleste de la Lady Chapel de la Cathédrale d’Ely se prête glorieusement à cet enregistrement qui fait suite à celui d’Illumina (COLCD125) et représente la seconde prestation pour Collegium du Chœur de Clare College de Cambridge. Das Thema dieses Albums ist die Musik des Himmels und unserer Reise zum Himmel. Diese beiden Begriffe können natürlich nur in Bildern vorgestellt werden, nicht objektiv beschrieben werden. In der mittelalterlichen Christenheit gab es eine klare Vorstellung vom Himmel genauso wie von der Hölle, und die Bilder, die von Dichtern and Künstlern benutzt wurden—und von den Kirchenmännern, die nach Zuckerbrot und Peitsche Ausschau hielten, um die Herde in Schach zu halten—sind uns noch heute vertraut: Der Himmel (über uns) ist ein Ort, wo die Bewohner in weißen Kleidern auf Wolken sitzen und die Engel unaufhörlich singen und Harfe spielen. Die Hölle (unter uns) ist ein brennender Hochofen, der von Teufeln mit Hörnern, Schwänzen und Mistgabeln geschürt wird, um die verlorenen Seelen zu knuffen und puffen, die in ewiger Qual heulen. In dem Maße, wie Wissenschaften und Rationalismus Fortschritte gemacht haben, ist diese simple Vision unscharf geworden. Die Theologen der Gegenwart, die zur Hauptrichtung der christlichen Tradition gehören, tendieren dahin, Himmel und Hölle immer mehr abstrakt zu definieren, oder sind der Ansicht, dass Himmel und Hölle nicht mehr sinnvolle Begriffe sind. Paradoxerweise ist die Musik, vie von alten mittelalterlichen Vorstellungen inspiriert ist, beliebter als je zuvor: Die großen Requiem-Schauplätze von Mozart, Verdi, Fauré und anderen Komponisten lassen überall in der Welt Menschen in Konzertsäle und Kirchen strömen. Hinter diesem fast zu vertrautem repertoire von Musik, die den Weg vom Tod zum Leben ausdrückt, gibt es einen Reichtum von Musik kleineren Umfangs, die über die Jahrhunderte hinweg die Rituale bei den Übergängen im menschlichen Leben begleitet und den Gläubigen eine Vision von dem Leben nach dem Tod gegeben hat. Diese Album stellt einige der besten und inspirierendsten Beispiele zusammen, die absichtlich aus verschiedenen Epochen und Traditionen genommen sind; einige davon würden normalerweise nicht auf der gleichen Aufnahme zu finden sein. Oberflächlich gesehen haben William Byrd, der Iustorum animae komponierte, und der amerikanische Sklave, der zuerst Deep River sang, wenig gemeinsam; aber ihre Sehnsucht nach dem Himmel war die gleiche. Das Programm ist in drei Abschnitte unterteilt, jeder wird durch einen Gregorianischen Gesang eingeleitet. Der erste Abschnitt ist der Musik der Trauer und der Erinnerung gewidmet, der zweite Abschnitt geht weiter zu dem Gedanken an den Bestimmungsort der abgeschiedenen Seele, und der letzte Abschnitt führt in den Himmel. Die fast himmlische Akustik der Lady Chapel der Kathedrale von Ely gab einen herrlich angemessenen Schauplatz für diese Aufnahme her, die Illumina (COLCD 125) fortsetzt und für den Chor vom Clare College Cambridge der zweite Auftritt bei der Plattenfirma Collegium ist.